Having recently assisted 3 major lenders design their hotel lending programs and hotel loan documentation, the hotel lawyers in JMBM’s Global Hospitality Group® believe that now is the best time for hotel lending in 20 years. My partner, Guy Maisnik, and I thought you might like to know why we believe this is true. So, here’s why. Why hotel lending is different. . . and some things you should know. “NOW” could be the best time for hotel lending since the early 1990s. We are at the bottom of an economic and a hotel cycle. 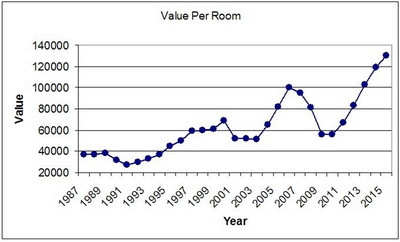 Hotel values per room are back to where they were in 1996, without inflation adjustment. The current shortage of debt financing for hotels means underwriting can be conservative, and spreads offer attractive profits. And hotel industry fundamentals are now improving from the worst collapse since the Great Depression. Thus, if a hotel can service debt now (or as restructured), on current lending standards, it is hard to imagine a better time to lend. Having recently assisted three major lenders design their hotel lending programs and loan documentation, we believe that “now” is the best time for hotel lending in 20 years. This article will explain why. The lenders who delay getting back into hotel lending for another year or two that will regret missing the best lending opportunities. But all lenders should observe a few cautions as they get back in the game. See “Avoiding the pitfalls in hotel lending . . .” below. Timing is important. Certainly, good underwriting, solid due diligence, and conservative loan standards are helpful too. But making loans at the bottom of a market is always safer and more profitable than at the top of the bubble. Early in the cycle is better than late. Early in the lending cycle, with less competition, lenders are able to maintain the discipline to impose tougher lending standards. Today, for instance, loan to value ratios (LTVs) for hotel lending are probably in the 50-60% range, and debt service coverage (DSC) requirements are roughly equivalent to 1.5 times the debt service payments. And of course, these requirements are applied to historically depressed values and cash flows. Early in the cycle, borrowers often reluctantly agree to recourse, but recourse becomes harder to get as the cycle progresses. There are other big advantages to those who get in the game early. According to Smith Travel Research, from August 2008 through 2010, the hotel industry lost $17 billion in hotel revenue. That is $41 million lost revenue per day from 215,000 fewer rooms sold per day. Almost 60% of the revenue decline was due to lower room rates, and the other 40% was due to lower demand. 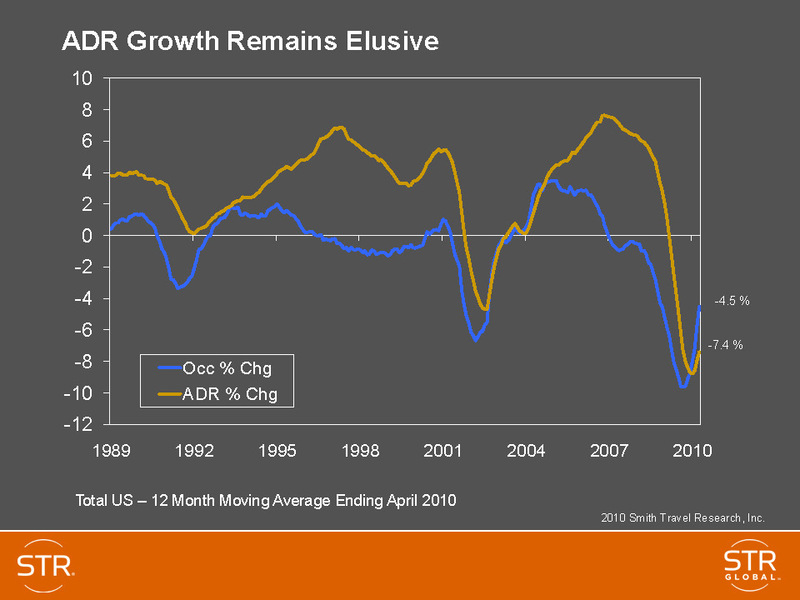 Accompanying these deteriorating hotel industry fundamental metrics was a punishing loss of hotel value. Here is a chart based on data presented by Steve Rushmore, founder and CEO of HVS International, in June 2010 at the NYU hotel conference. Just look at this chart of hotel valuations and consider whether you would have preferred to make a hotel loan at 60% loan to value (LTV) at the cyclical lows in hotel valuation (such as in 1992-1995, or in 2002-2003 just after 9/11) based conservative cap rates applied to extremely low trailing 12 month actual NOIs. And compare making 60% LTV loans on low values to making 85% LTV hotel loans at peak values based on low cap rates applied to “projected” or pro forma NOIs as was common at the peak of the bubble years in 2005-2007. Does it strike you as odd that leverage seems to increase as values rise, and debt service coverage (DSC) shrinks from 1.5 to 1.2 even based on revenues approaching bubble peaks? Maybe it is just the intense competition among lenders that develops later in a cycle, but inevitably the lending standards get lowered as the cycle goes on, particularly as lenders take risks to keep their best customer relationships. LTVs soar on higher values based on increasingly aggressive valuations that climb high toward the inevitable peak. The following chart from Smith Travel Research gives a 20 year picture of hotel industry fundamentals, again suggesting that the best to lend on hotels (or buy hotels) is now, and that this will probably continue for the next two or three years. Another phenomenon that we see in every lending cycle is the deterioration of profit margins and spreads. Early in the cycle, loans are priced at margins 450-550 basis points over LIBOR or otherwise have attractive spreads over other indices. Later on, when lending is actually riskier, these spreads shrink dramatically to provide very poor risk-adjusted returns. With virtually no debt financing for hotels since the financial meltdown, there is great pent up demand and lots of attractive borrowers. Initially, there will be little or no construction financings. And existing projects being financed will either be new buyers with a new, realistic valuation on a hotel reflecting the current environment or a “recapitalization” of a distressed situation which greatly reduces or eliminates existing debt. And there will be the occasional property that was not bought or refinanced between 2005-2007 at prevailing leverage and terms. So there should be a ready supply of new borrowers with staying power, realistic expectations and a revitalized capital stack, looking to add a little debt the property should be able to handle in all but a nuclear winter. From the vantage point of mid-2010, with a sustainable recovery seemingly underway in both the national economy and the hospitality industry, we note that the Wall Street firms have already begun re-entering the hotel lending market, with notable entrants such as Deutsche Bank already launching their programs. And several of the largest banks are also looking to start lending on hotels again. Interestingly, we are seeing a mix of lender approaches. Some plan to lend for their own portfolios or syndicate the loans the old fashioned way. Some expect a new version of CMBS or securitization (“CMBS-II”) to return later this year and expect to be able to off-load the new loans from their portfolios when that market reawakens. Avoiding the pitfalls in hotel lending . . .
We believe that NOW is the best time for hotel lending in 20 years. However, anyone wishing to take advantage of this window of opportunity should know a few critical issues and avoid some dangerous pitfalls. It is a little like taking a flight overseas: Millions of safe passenger miles prove it is safer than driving a car, but your airplane needs to go through a pre-flight check, and your pilot better have the necessary training, experience and licenses. Otherwise things could turn out badly. With a team of hotel veterans who have been through every cycle since the 1980s, have been through more than 1,000 workouts, bankruptcies and receiverships, and wrote the book on troubled hotel loans (The Lenders Handbook), we have a few thoughts to guide you safely on this journey. Please see the other articles in this series cited above. Guy Maisnik is a partner and senior member of JMBM’s Global Hospitality Group®. Guy advises clients on hotel transactions, representing lenders, opportunity funds, banks, special servicers, owners, REITs and developers in hotel transactions, including senior and mezzanine financing, workout and debt restructure, co-lender, participation and securitization arrangements, joint ventures, management agreements, buying, selling and ground leasing of hotels, complex mixed used resort development, fractional and timeshare. For troubled hotels, Guy develops and executes strategies for CMBS and whole loans, and REOs. He also assists investors with recapitalization of distressed borrowers and purchases of troubled assets. Guy has recently assisted 3 major lenders in completely revising and structuring hotel lending programs and documentation, including a hotel construction lending. Guy’s practice is both domestic and foreign, where he has advised on hotel matters all throughout the United States, Mexico, Canada, South America, Caribbean, Europe and Asia. 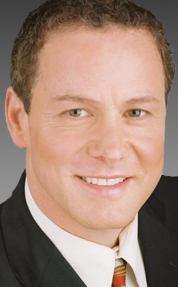 He has been recognized in California Real Estate Journal’s Best Real Estate Lawyers, Los Angeles magazine’s Top Southern California Lawyers, as well as a Top Real Estate Lawyer in Real Estate Southern California magazine. For more information, please contact Guy Maisnik at 310.201.3588 or mgm@jmbm.com.